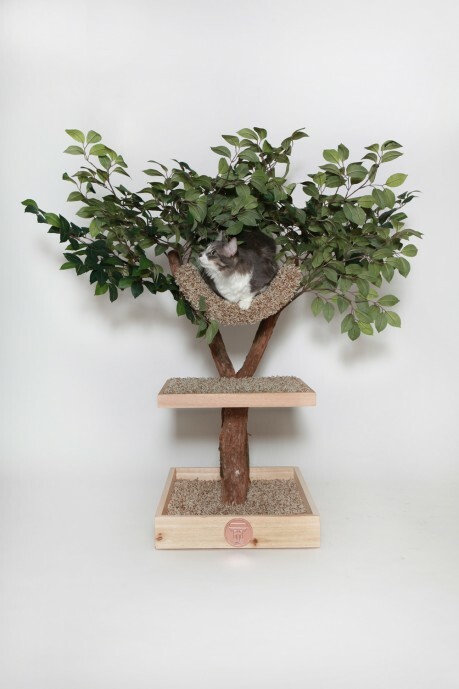 KIT-TY Tree - Cat Fancy Editors' Choice Award Winner 2013Nesting Tree - Cat Fancy Editors' Choice Award 2012 Winner! 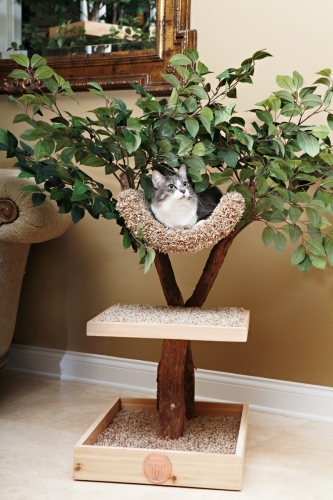 This little Seedling Tree House is perfect to place in your cats favorite corner. This Tree House is custom made making it one of a kind. The Seedling (ex-small) Tree House is purrfect for your special cat. Tree House gives your cats the room to play, jump, explore and sleep. Crafted of wood, cedar, plush carpeting and synthetic silk leaves, this house brings out the kitten in you cat. Not only is Tree House an interactive play center for your cats, it is beautifully constructed blending in with your home. Please call for shipping quote to Hawaii and Alaska. Please email your complete shipping address for quote. Available in neutral carpet color. Tree comes fully assembled with the exception of the leaves. There will be colored pegs indicating where to insert the leaves.